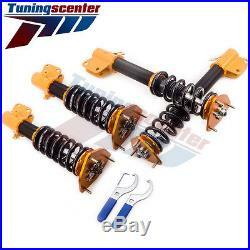 TCT Coilovers for Subaru Impreza WRX 02-07 WRX STI 04 Saab 9-2X Adjustable. Subaru Impreza WRX 02-07 GDA GDB (WRX Wagon, 2.5RS Models). Subaru Impreza WRX STI 04 GDA GDB. Type : Suspension parts / shock absorber / coil spring over struts. Spring Rate : 9kg/mm (504lbs/in); 7kg/mm (392lbs/in). Camber plates / top mounts : adjustable & pillow ball design. 24-way Adjustable damper force coilover is also available. Pillow ball top mount -- this design helps combat noise while tuning. It also improves the steering feel and response. Most components are made from 6063 aluminum with T6 for increased hardness -- the advantages include excellent strength, and aluminum helps keep the weight down. Hi Tensile performance spring - Under 600,000 times continuously test, the spring distortion is less than 0.04%. Please return your item(s) in original packaging and ensure that all packages are securely wrapped. Then, the updated result will be informed. Will this fit my car? Please make sure you have read through the whole listing and paid attention to note and notice. When will my order be dispatched? Can I amend my order? What do I do if I have not received my order? What do I do if my product is faulty? It will speed up the process if you could provide us some pictures or video to illustrate the issue details. Other items you might also like. The item "TCT Coilovers for Subaru Impreza WRX 02-07 WRX STI 04 Saab 9-2X Adjustable" is in sale since Thursday, December 22, 2016. This item is in the category "eBay Motors\Parts & Accessories\Car & Truck Parts\Suspension & Steering\Shocks & Struts". The seller is "tuningscenter" and is located in Rowland Heights, California.